Designed by San Francisco architect Arthur Brown, Jr., and erected between 1932- 1934, the Andrew W. Mellon Auditorium serves as the central focus of his tripartite building group. Like other buildings in the Federal Triangle, Brown’s trio of buildings is constructed of steel frames clad in Indiana limestone. Red terra-cotta tiles clad the roof of the seven-story auditorium building. Colonnades resting on arched portals connect the temple-form auditorium to symmetrically flanking buildings occupied by the Interstate Commerce Commission (ICC), Department of Labor, and Environmental Protection Agency (EPA) encompassing nearly six acres and extending 1,000 feet along Constitution Avenue. However, in contrast to the horizontality of the adjacent office buildings, the Auditorium has a strong vertical emphasis. This verticality is countered by a classical, tripartite division of the facade consisting of a 2-story rusticated base, a mid-section of 3 stories, and an attic consisting of a monumental cornice and pediment. 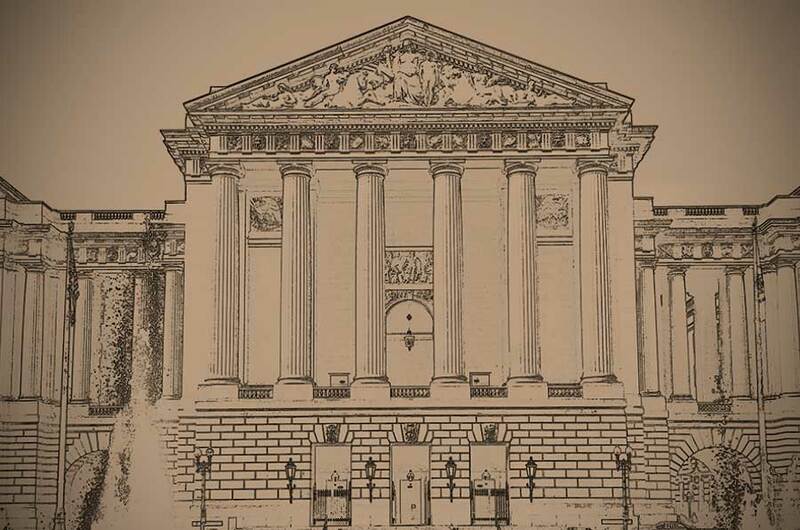 Formerly known as The Departmental Auditorium, The Andrew W. Mellon Auditorium faces Constitution Avenue and is entered through three doorways in deeply channeled Indiana limestone above Deere Island pink granite. Granite stairs rise to the main doors. 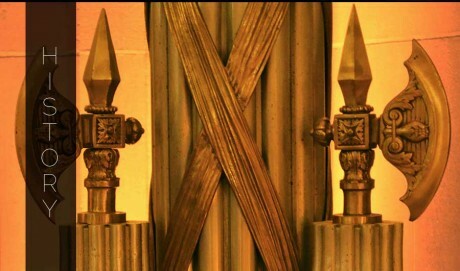 All three arched entrances stand 20-feet tall with gates of gilded and burnished aluminum, topped with spearheads and tassels. Framing the entrances are four 10-foot-high bracket lamps with supporting foliated volutes and a pineapple finial of gilded and burnished aluminum with an oxidized finish. Six colossal fluted Roman Doric columns rise 62 feet 6 inches above the base to create the auditorium’s portico. 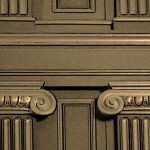 The columns are matched by fluted Doric pilasters set against the smooth limestone back wall. This exterior elevation is embellished with Beaux Arts sculpture, including an allegorical pediment group, figural keystones, metopes in 26 designs and bas-relief panels displaying Edgar Walter’s richly carved “Columbia,” symbolizing the country, national defense, and national resources. The grandeur of the building’s exterior is matched by its interior. Limestone-finished walls and piers define the space and frame views of the east and west staircases, the lobby, and the breathtaking auditorium beyond. The lobby’s marble floor is laid in rectilinear patterns of gold, pink, and dark red marble. At the heart of the building is the spectacular auditorium standing more than 60 feet in height and embellished with limestone pilasters, gilded relief carvings, and polished oak. Colossal luminaries, made of brass and burnished aluminum, are suspended from the ceiling. Fluted Doric columns surround the room consisting of crushed clam shell and serving as acoustical stone. Also constructed of crushed clam shell are the auditorium walls with the lower portions pierced only by doors and vents with ornamental grilles. Such detailed construction practices helped to make the Mellon Auditorium an acoustical marvel considering it’s grand size and scale. GSA modernized the auditorium in 2002-03. The project restored exterior stonework and key interior spaces such as the three smaller break-out rooms where the deep green glaze and gold leaf accents of the wood-paneled walls were restored to their original appearance. 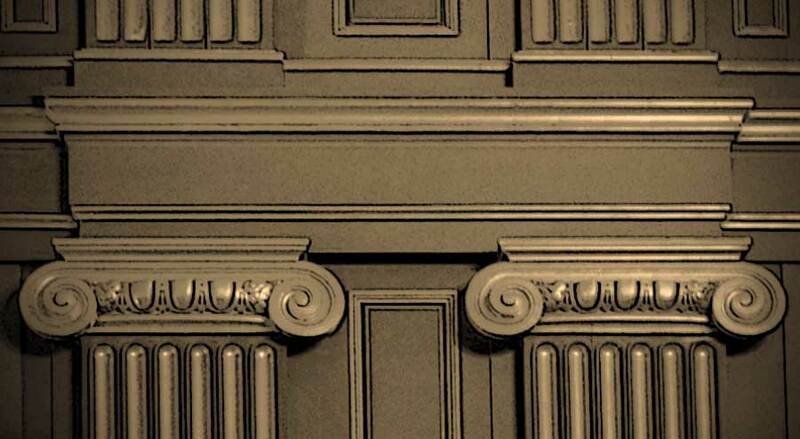 Refined Doric details articulate the Andrew W. Mellon Auditorium, first known as the Departmental Auditorium, the most dramatic example of Classical Revival architecture in the Federal Triangle. The Triangle is a massive complex of government buildings constructed during the 1930s on a site bounded by Pennsylvania and Constitution Avenues between 6th and 15th Streets, NW. The 70-acre project was the largest building program undertaken by the government at that time and the first federally funded urban redevelopment project of this scope. As such, it provided a model for city planning in the 1930’s through 1950’s. The new buildings were to be designed to reflect the “dignity and power of the Nation”. Though Michigan Senator James McMillan introduced legislation in 1900 authorizing plans for developing an urban park system and for the siting of future Federal buildings, plans to redevelop the area between Pennsylvania Avenue and the National Mall did not truly began to take shape until the 1902 report of what has become known as the McMillan (or Senate Park) Commission. The Commission was a group of four prominent designers appointed by Senator McMillan, chairman of the Senate District Committee, to chart the future of Washington’s historic core. McMillan’s plan proposed that the triangular area south of Pennsylvania Avenue, north of the mall and east of the Ellipse be developed for Federal office buildings and museums. The plan for the Federal Triangle was tied to the passage of the Public Buildings Act of 1926 and, finally, in January, 1928 the Triangle Bill was passed authorizing the acquisition of land and $50 million for the allocation of funds. Because the Departmental Auditorium design was developed several years after the initial Federal Triangle plans were published, a well-respected and influential team of architects, known as the Board of Consulting Architects, was assembled to finalize the design of the Federal Triangle buildings. The board considered Classical Revival architecture appropriate for conveying the power and permanence of the national Government. Arthur Brown, Jr., an Ecole des Beaux-Arts-trained architect from San Francisco, became responsible for designing an ensemble to house the Labor Department, the Departmental Auditorium, and the Interstate Commerce Commission. Brown was granted a contract for the preparation of preliminary drawings for the three-part building group in October, 1928. The central element in the three-part building group was planned as a great temple facade encapsulating a planned courtyard that would link the two large office buildings flanking either side. During the 1930’s, as the government was in the midst of its ambitious building program, there arose the question of a lack of assembly space for large gatherings and ceremonial occasions. At this time, the largest government-owned assembly spaces were the Commerce Department conference room and the House of Representatives chamber in the Capitol. As the need for a still larger assembly space became acute, the plan for the courtyard was eagerly replaced with a vision of the magnificent Auditorium. On February 25, 1935, President Franklin D. Roosevelt dedicated the auditorium, opening the door to the numerous historical events that have taken place through the years. President Roosevelt returned in on October 29, 1940 to initiate the Selective Service System lottery. Other draft lotteries were held in the auditorium in 1941 and 1942. President Harry S. Truman hosted the 1949 signing of the North Atlantic Treaty in the auditorium, which established the North Atlantic Treaty Organization (NATO). The building was renamed in 1987 in honor of Andrew W. Mellon, who oversaw the development of the Federal Triangle complex while serving as Secretary of the Treasury from 1921 to 1932. The Mellon Auditorium was listed in the National Register of Historic Places as a component of the Pennsylvania Avenue National Historic Site in 1966. In more recent years, the building has been used for a vast array of functions: concerts, conferences, Inaugural balls, weddings, private receptions, and has even served as a set for several movies and television shows, including “The West Wing”, “Contact”, “Transformers”, “State of Play”, and “Top Chef”. 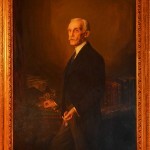 As Secretary of the Treasury, Andrew W. Mellon played an instrumental role in the Federal Triangle building project. The Public Buildings Act of 1926 gave him direct responsibility for the program, including the acquisition of land by purchase or condemnation, the preparation of designs, awarding of contracts, and the supervision of construction. In Sculpture and the Federal Triangle (Smithsonian Press, 1985), respected art historian and curator, George Gurney, stated, “In less capable hands, development of the large Federal Triangle project might have been fragmented.” Gurney credits Mellon for the ability to think in large terms–never losing sight of the grand, esthetically unified design–while synthesizing the numerous and changing demands of a project so massive in scope. Secretary Mellon was determined that the Federal Triangle would be the product of a well-integrated plan. To that end, he created the Board of Architectural Consultants to establish an overall scheme and to determine the aesthetics of the project in advance of any of its individual components. 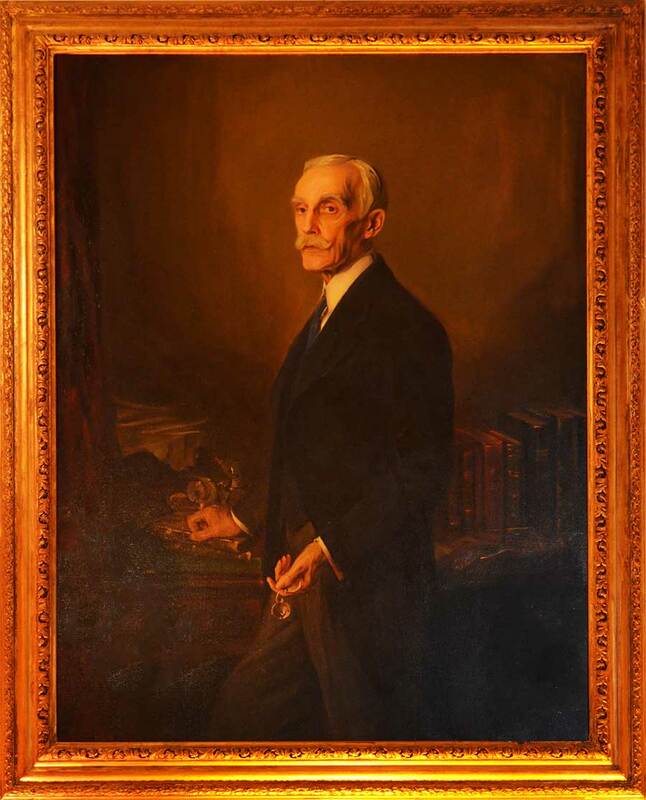 In 1933, Andrew Mellon stepped down as Secretary of Treasury to become ambassador to Great Britain. In Gurney’s words, “the Board had lost its most influential supporter of its goals.” The function of the Board in carrying out the grand design of the Federal Triangle dissipated as the new Roosevelt administration in 1933 began appointing architects to the board whose backgrounds were not closely associated with the tradition of planning and architectural design in Washington. Although the landscaped “Great Plaza” was never realized, the dignified architecture of the Federal Triangle, and the Mellon Auditorium in particular, remains intact. 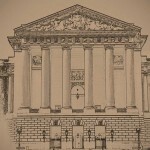 In August of 1987, through initiatives by Senator Patrick Moynihan and Paul Mellon, Jr., the Auditorium was renamed “Andrew W. Mellon Auditorium” and has returned, in both form and function, to its intended splendor of which Mellon would be proud.